The life of Harriet Tubman, African American freedom fighter and former slave, is a gift for an opera composer. Born on a plantation in Maryland, Tubman escaped to the North and became a heroine of the ‘underground railroad’, helping thousands to freedom. After fighting in the Civil War, she settled in New York State, married a young soldier of 22 (she was 44) and lived until she was 90. Mexican composer Hilda Paredes has managed to distil this story into a vivid, punchy chamber opera for two voices and three instruments. The UK premiere took place during the Huddersfield Contemporary Music Festival – a hotbed of experimentation – so this was no historical recreation with period costume. Jean Lacornerie’s staging includes crisp LED lighting and stark, cartoonish projections beamed onto a curtain of white filaments. Paredes’s score, played live on violin, guitar and percussion and backed by an electronic landscape designed by Monica Gil Giraldo, remains bright and surprising over the 90 minutes. Anchoring the ‘monodrama’ is high soprano Claron McFadden, a proud figure in a severe black gown and Puritan neckerchief. 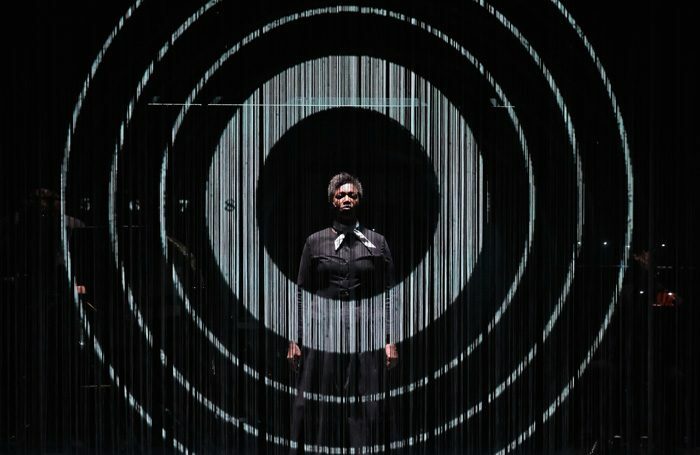 It was McFadden’s suggestion to make an opera about Tubman, and Paredes has written dreamlike, stratospheric phrases for her extraordinary voice. McFadden shares the narrative with agile soprano Naomi Beeldens, combining lyrical recitative with Sprechstimme and snatches of well-known spirituals. Bringing the story into the present, newspaper headlines chart the progress of the civil rights movement and the opera ends with a hopeful image of the young Barack Obama on the screen. Unvoiced is the thought that the current president could right now be undoing all that Harriet Tubman fought for.